Corsica Furiosa is the latest from French niche line Parfum d’Empire, and it centers around mastic, native to the island of Corsica, where perfumer Marc-Antoine Corticchiato spent part of his childhood (he was born in Morocco and spent part of his childhood there as well). It is perfectly named; the PR materials refer to a "a verdant blast" and that's exactly what Corsica Furiosa is all about. The "verdant blast" starts off with plenty of lime-y citrus. It's resolutely, unapologetically green and smells strongly of the outdoors, untamed, in high summer: there are grassy notes and an overdose of tomato leaf, some almost-sneezy black pepper, flashes of peppermint and other green herbs, crushed pine needles and plant sap (the listed notes include mastic, eau de vie, wild mint, tomato leaf, pepper, honey, hay, cistus and oakmoss). And yes, pretty much all at once. It's not entirely linear but it's relatively linear; the dry down does get softer, and the sharpness of the opening turns to a softer, rounder sort of (brownish, late-summer) green, with hay and tobacco leaf tempering the astringent tomato leaf and a bit of sweetness over the mostly dry, spicy-mossy-woody base. The most positive, tactful interpretation I can come up with would be a tomato leaf garden drenched by a tidal wave of gin-and-tonic, and located at the base of an icy Alpine mountain in Switzerland. So, as always, try before you buy. I would love to hear comments on Parfum d'Empire's new packaging (shown above). Does anyone love it? I don't, and I hate that there are no longer 50 ml bottles. Boo, hiss. If you'd like a green that's a little less uncompromising, and maybe easier to take to the office, Costume National's Cyber Garden might fit your purposes. Like Corsica Furiosa, it is aptly named, and smells reasonably like its inspiration as a "...futuristic vision, an imaginary scene of what a garden would look like far beyond our present time." It was developed by perfumer Antoine Lie around three accords (Green Ether, Vynil Accord and Hybrid Moss). This is a fresh, clean, bright sort of green with a sharp citrus opening and a (presumably) purposefully synthetic aura: you might pick out some of the notes, but it doesn't smell like any natural material in particular, and it definitely doesn't smell like the outdoors. It's been hanging around in my purgatory basket ever since I got a sample last year: the metallic edge is sort of interesting, but it's got a tendency to smell oddly sour on my skin, and the synthetic freshness gives it an unfortunate kinship with the many fresh greenish men's colognes on department store fragrance counters. Nicely done, though, and worth a try. Do comment if you've tried it, or if you have any favorite green fragrances you'd like to recommend! Parfum d'Empire Corsica Furiosa is available in 100 ml Eau de Parfum, $145. For buying information, see the listing for Parfum d’Empire under Perfume Houses. 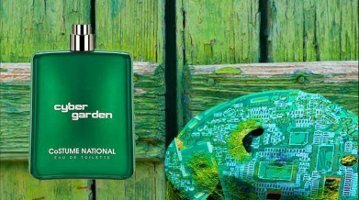 Costume National Cyber Garden is sold in 50 and 100 ($100) ml Eau de Toilette. For buying information, see the listing for Costume National under Perfume Houses. Note: top image is Corsica [cropped] by liquene at flickr; some rights reserved. 1. In that sense, it reminded me of Diptyque Virgilio, if anyone remembers that one. 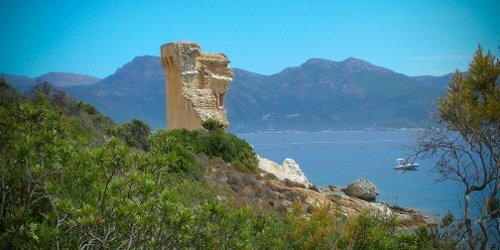 Corsica Furiosa is also distantly related to Diptyque's L'Eau Trois, but only distantly. I’m with you all the way! I got a sample a couple of weeks ago and fell in love with it- the opening is like getting whacked upside the head with the Jolly Green Giant in scent form. I also totally enjoy the soft dry down. I will not be purchasing the 100ml, do you hear that Marc? You know, even in 50 ml…I don’t know, I’m not usually fanatical about packaging but really, I find that bottle hideous. Maybe it’s just bugging me because I thought the old packaging was rather nice? Have not tried anything from Masque yet (niche brand fatigue) — is that comparable to anything else I might know? I’ve tried this and liked it, but it didn’t stick around long on my skin. I was dabbing though, and will have to see if a spray will diffuse and stick around longer. But I have to say it was different from what I was expecting. I’d thought, given its name, that it would be a wilder, darker green scent. Instead, it smells like an herb and vegetable garden to me – and my husband thought it smelled like I had made a salad. Oh, and I’m with you on the bottles – I think they’ve only changed the cap, but it’s funny how that one small change has rendered them hideous. Haven’t tried Cyber Gardens yet (along with many, MANY other things), but sounds like something CdG would do. A salad — that’s funny! It does not have huge sillage on me after the first few minutes but it doesn’t disappear quickly either. And ha! I did not notice, but you might be right that all they’ve done really is change the cap. Well, it’s so ugly with that bottle shape that it matters! But also they’ve made the label plainer and uglier. This had great longevity on me and I really enjoyed the soft dry down that stuck around till bed time. I love me some salad so it’s all good as far as I’m concerned. Sorry it didn’t last on you! I have 4 PdE decants and all of them have great lasting power. This sounds like something I’d like but I do not like that bottle at all. It looks like some kind of upmarket hair product! Yes. I kept thinking shampoo. Really bad, hope they change to something else. I’m not-very-hopefully hoping they carry on with this nonsense if they must, but also introduce 10 or 15 ML travel sprays. I’d accept plain packaging for that. Hey, me too. If they did 15 ml, I’d take it in a lab bottle. I’d take it in a ziploc bag. I’ve only tried this on paper as I was in one of these Aladdin cave sort of perfume shops where they sell Guerlain extraits and other gorgeous things, but I LOVED it. I think in the long run Azemour, as it is less linear, seems to have more to say but I wouldn’t mind a bottle of this at all. They should do a coffret of 15 ml bottles: this, Azemour, Osmanthus Interdite. Swap Osmanthus for Fougère Bengale for me and I would be perfectly content! I wish I could do emoticons. Why can’t you do emoticons? Actually, was going to add that it’s absurd how often I still have to look them up, other than the basic smile. Somebody, somewhere, maybe, loves them, but I have yet to see anyone admit it online so far. I do! I have three old-style FBs which I got on a discount right before they changed and I am not really a fan of the cap – is it meant to look like a crown? Too majestic for me. I like the round caps better. But I know where people who prefer the old design are coming form. Good, thanks for chiming in! It reminded me of the old L’Artisan cap, and yes, sort of like a crown. I’m not sure why they bug me so much, when Parfums de Nicolai’s bottles really don’t. It’s like they tried to make them uglier? I sampled this several weeks ago & absolutely LOVED it. This summer I seem to be drawn towards green scents, of all intensities, and this one really impressed. I love the way he used the mastic in a skillful and skillfully blended way – most of the time it can either smell too raw (like an aromatherapy scent…I’m thinking of Aveda or Aesop) or too synthetic (wasn’t Sisley’s Eau de Ikar supposed to be mastic prominent? I found it just too screechy). CF strikes the perfect balance. I must admit Cyber Garden sounds awesome. Reading your review of it reminded of my Favorite New Intense Green Scent: Serpentine by Comme des Garcons. Sort of a post-industrial-version of Bel Respiro by Chanel. Another fun green: Sugi by CdG x Monocle. I could go on and on…so I’ll stop. I didn’t “get” Ikar either…seemed like basic cologne. Then again, I didn’t spend much time on it. Ditto on Serpentine, which I sent off to Kevin I think…I probably should have tried it a few times first. I don’t know the Aveda but the Aesop is a great scent, & so is Sugi. And I am still fan of the Miller et Bertaux Green x 4. See what you think of the Cyber Garden. I really tried to fall in love with it, but just couldn’t. I’ve only tried this once from a dauber vial. Liked it at first but as it gets less furiosa, I lost interest. Should try it again, but obviously not going to buy a 100-ml of anything if I can help it, so perhaps I should let it languish. I do love Virgilio (and should have worn it today, actually). Also love the greenness of L’Ombre dans l’Eau. I know what you mean about the 100 ml. I do think more brands are getting the message…the number of things now available in small sizes at Sephora now is amazing, but niche is lagging behind mainstream in this area. Ok. I don’t mind the bottles. I liked the old ones, and I like these ones too. I’m so looking forward to trying CF! Green is one of my very favouritist (yep that’s a word ) scent categories, and I prefer the non-galbanum to the galbanum, which can smell like swamp on me. I just don’t get the marketing strategy to cut the smaller bottle sizes, especially when I’m sure they know full well that there’s huge demand for them. It just seems greedy to me. I suppose it is possible they’re going to add back the 50 ml, & just hadn’t made them yet w/ the repackaging? We can hope.